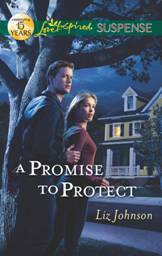 Aimymichelle: A Promise to Protect blog tour. Summary: Navy SEAL Matt Waterstone knows about keeping people safe. When his best friend’s sister is attacked, Matt promises no harm will come to Ashley Sawyer–not on his watch. But Matt’s not the only protective one. Ashley will do anything to safeguard the residents of the battered women’s shelter she runs. She’s sure she can handle the threats she gets in return. What she can’t handle is the way Matt scales the walls around her heart. Yet when she falls prey to a crime web more sinister than she’d realized, trusting Matt could be the only way to survive. Cover Art: About the Author: Liz Johnson graduated from Northern Arizona University in Flagstaff with a degree in public relations and set out to work in Christian publishing. In 2006 she got her wish when she accepted a publicity position at a major trade book publisher. While working in the industry, she decided to pursue her other dream—becoming an author. She is now a two-time ACFW Carol Award finalist, and A Promise to Protect is her fourth novel with Love Inspired Suspense. Liz makes her home in Nashville, TN, where she enjoys theater, exploring the local music scene, and making frequent trips to Arizona to dote on her two nephews and three nieces. She loves stories of true love with happy endings. Keep up with Liz's adventures in writing at www.lizjohnsonbooks.com, or follow her Author Photo: Author Interview: What’s your new book, A Promise to Protect, about? Ashley Sawyer has been the director of a battered women’s shelter for three years, so she’s no stranger to dealing with threats. But when she helps a young woman disappear, the threats become more intense than she’s ever experienced. Navy SEAL Matt Waterstone is happy to check on his best friend’s little sister, certain he can take care of the situation. But as Matt and Ashley search for the source of the threats, they uncover a plot more sinister than they ever imagined . . . and a love they never expected. How did you get interested in writing about Navy SEALs? When I was in college, I picked up a novel about a SEAL, and I was hooked. Who were these men unafraid of facing down the worst in this world? Who would go through such torturous training to be called the elite? I began watching documentaries on Special Forces units and reading everything I could about the men on the teams. Lately I’ve been reading biographies of SEALs including Lone Survivor by Marcus Luttrell and Fearless by Eric Blehm, fascinated by the type of personality it takes to become a SEAL. It’s been said that good writers are good readers. What do you enjoy reading? I’ll read just about anything that I can! And I read as often as I’m able. That translates into—whenever I’m not on deadline. My favorite books cross genres and years. As a kid, I read The Witch of Blackbird Pond, and I loved it! Still do. As an adult, I’ve really The Princess Bride and The Guernsey Literary and Potato Peel Pie Society. Mostly I just enjoy a rich story with a happily ever after. What have you enjoyed reading recently? I’ve written three books this year—met three deadlines—so I haven’t had as much time to read as I’d like. But I did catch new books by some of my favorite historical authors—Julie Klassen and Karen Witemeyer. On a recent road trip I finally listened to the audio version of Susan Meissner’s The Shape of Mercy. It was wonderful! Liz, what’s up next for you? Right now I’m working on the follow up to A Promise to Protect, which is due out next year. It’s about Ashley’s brother and Matt’s best friend, Tristan. Then I’m scheduled to write a third book in my SEAL series. I’ve loved writing about the men of SEAL Team FIFTEEN and the women they fall in love with, so I’ll be sad when the series wraps up. I’m also working on a contemporary romance and bouncing at least a hundred and three other ideas around my mind. Excerpt: “Tristan is the closest thing I have to a brother. He’s worried about you, and so am I. Let me help.” Fear flickered through Ashley’s eyes as she whispered, “Someone almost ran me over.” “Tristan said something about a letter,” Matt pressed. Ashley nodded. “When I got home that day, there was an anonymous note saying that someone wanted his property back.” His gut clenched. What kind of jerk threatened a battered women’s shelter? “Listen, I’m in town for a few days. Let me look into things.” She smiled up at him. “Thanks, but I got the note more than a week ago. If there was any danger, something else would have happened by now.” As they reached her car, her smile died. He didn’t have to ask if she still thought the threat had passed as she took in the smashed windshield of her coupe. Tucked under a wiper blade, the person responsible for the mess had left a clear message. If I don’t get what’s mine, you’ll get what’s yours. Seems like a fantastic book!